There’s a theory – go in with low expectations and you won’t be disappointed. I used this theory with some success on Thursday night when I went to see the recent three-peat premiership winning but now cellar-dwelling Hawks take on the top-of-the-table Crows at the Adelaide Oval. I was not particularly confident but hoping for a good contest. Against all odds (unbelievably paying $7.50 in a 2 horse race!) the Hawks managed to pull off a miracle win! I don’t often subscribe to this theory in running events. If I don’t expect to do well, I generally don’t run. (As evidenced by my recent ‘wussing out’ of the Mt Misery race, and to a lesser extent, the Cleland 50k). This weekend was different. I’d been running laps around the 6 hour event course for the past 3 weeks, and it was time for a break from the monotony! Never mind that I have done next to no hills training (Sturt Gorge 6 weeks ago was probably the last time I ran any kind of trail). But, it WAS an excuse for a weekend away with friends, so it was with little hesitation that I signed up for the 21.1km. The course was a 10.5km loop, with the options being 1, 2 or 4 loops. The mathematicians among you may have worked out that 4 loops = a marathon. This was the first year that the Tower Trail Run included a marathon. With running buddies Karen, Daryl and Wendy, I hit the road at reasonable o’clock on Friday for the drive to Mt Gambier. The journey was uneventful but I did insist on a rest stop at Coonawarra, which just happens to be one of Australia’s leading Cabernet Sauvignon regions. So, naturally there was some wine tasting (and subsequent purchasing) on the cards! Majella was our hydration stop and let’s just say it’s a good thing Karen and Daryl have an SUV with a big boot! The accommodation was nice – although my room was what appeared to be the back porch before an extension was built. It had no door (a doorway, but no door), it was a through room to the laundry, and there was a (frosted glass) window just above my bed, on the other side of which was the bathroom! 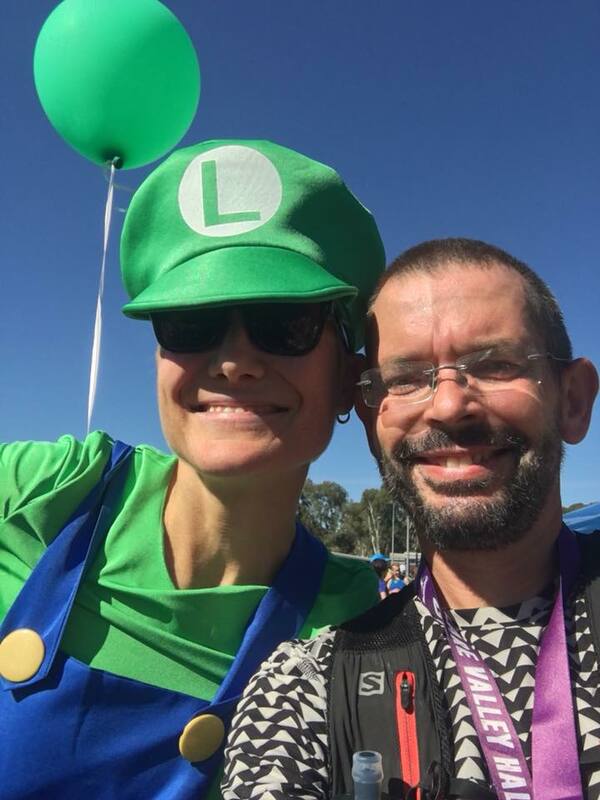 On Saturday morning we walked to parkrun and it seemed like half of Adelaide was there, including my Boston buddy Maree who happened to be in town for a party! Just a small part of the Adelaide contingent! It was my second time doing Mt Gambier parkrun so it held no surprises for me (Maree was also a ‘veteran’) although I had forgotten that the first climb is practically right at the start! The last time I’d been here was in December when the famous Blue Lake was at its picturesque blue best, and was constantly distracted by its beauty during the run! Now, it was more of a slate grey but I was still distracted, thanks to an amazing rainbow which seemed to end in the lake – I would have stopped and taken a photo had I brought my phone with me! Luckily Kristy had her phone with her to capture the rainbow! 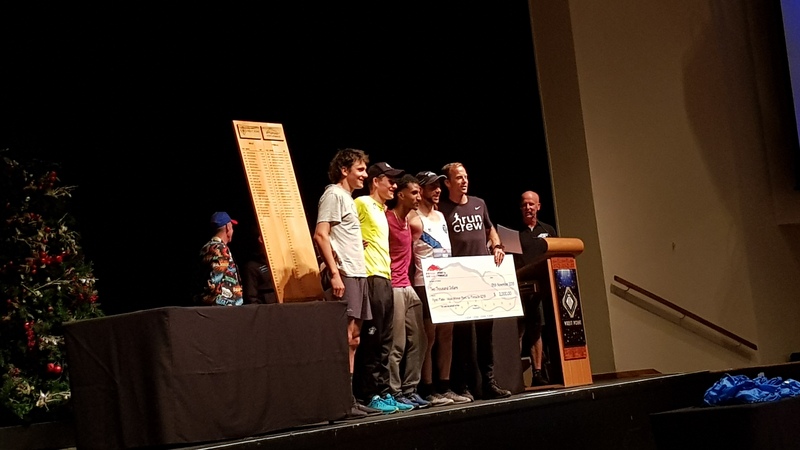 I ran most of it with Andy, one of the guys from SRG (Adelaide’s Southern Running Group), until he took off at the end – a few of the guys who had already finished were egging me on to chase him but I was ‘supposed’ to be taking it easy so I declined. Turned out he was just trying to get under 25 minutes, which he did, as did I. And Maree was first female! parkrun pic courtesy of Sputnik! As per tradition we gathered at the fantastic Metro Cafe and Bakery for coffee and some pretty spectacular looking cakes! The parkrun crew pretty much took over the entire place! 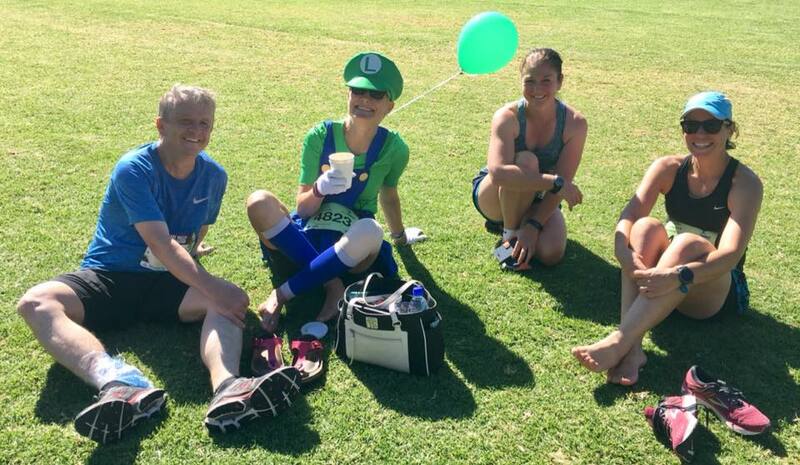 Pic from the Mount Gambier parkrun Facebook page. Karen trying to pick just one! We ended up booking in there for dinner as well, as they have a good vegan-friendly menu. In the afternoon we headed to check out Mt Schank. You can hike down to the bottom but we decided to save that for AFTER the run! The weather was pretty perfect on Saturday afternoon, though! I had an email from our AirBNB host, checking if everything was OK. I asked if there were any spare blankets, as it had been a little cold on Friday night. Later that afternoon she turned up unexpectedly with 3 brand new faux mink blankets which were much appreciated! Wine, cakes and warm blankets! 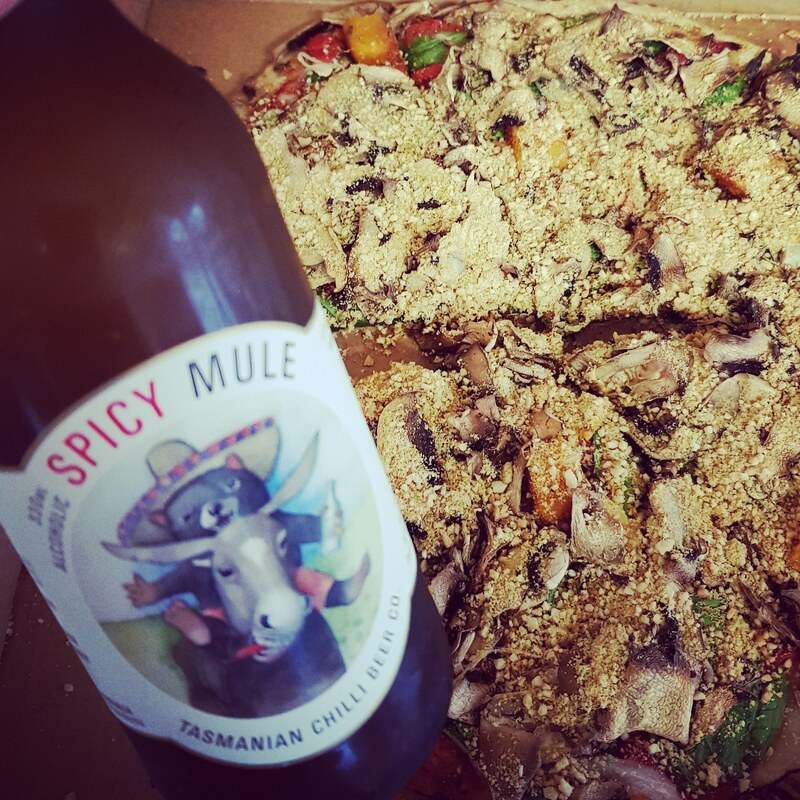 Yep – we know how to party on a Saturday night! Sunday morning was chilly but fortunately there was no rain at that stage, so we were able to walk to the start/finish line. We were all doing the half marathon which had a very civilised start time of 8:30! The marathon had started at 7, just before it got light. 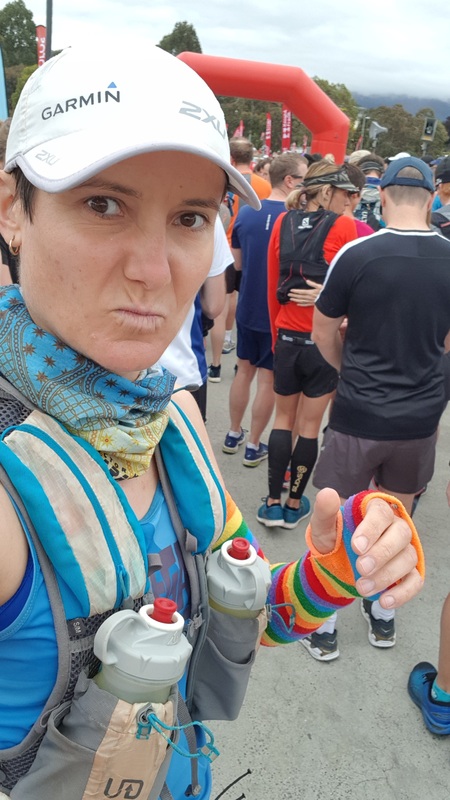 My pre-race preparation was nothing out of the ordinary other than a fair bit of angst and swearing while trying to put on my new gaiters – this would be my first time ever using gaiters. I had brought a singlet, T-shirt and long sleeved top with me, so I could decide on the morning what would be best. In the end I went with the T-shirt and arm warmers, as well as gloves. Sunnies did not look like they would be needed but I thought it best to take them just in case. Ditto with my cap, which would also keep rain (which was forecast) out of my eyes! With plenty of time to spare we made the short walk to the large permanent concrete shelter that served as the start/finish area. It was the ideal spot, with plenty of parking nearby, several permanent toilets (as well as portaloos!) and ample shelter. And the obligatory coffee van, which I was looking forward to patronising after the race! We got to see most of the marathoners coming past during the time we waited for our start. There were plenty of familiar faces among them, including Mick and Howard at the pointy end! Howard’s partner and support crew Pauline had kindly offered to look after our bags for us while we ran! Here’s me collecting my bib – Gary was there ready with the camera, as always! With the rest of the crew! Thanks to Wendy for this pic! At first I was running with Glen, one of the SRG runners, but it wasn’t long before he was ahead of me. I intentionally started conservatively. I had not much idea of what to expect, having not studied the course beforehand. I just didn’t see much point! The course was interesting, challenging and scenic. Being 2 laps, I used the first lap as a bit of a ‘reccy’. Quite early on I saw Sputnik, who took a pic of me and said “There’s one for your blog!” to which I replied that I was looking for suitable selfie spots on the first lap, then I’d actually take photos second time around! Thanks to Sputnik for this great pic! There were stairs, which I quickly realised I was better off walking up rather than trying to run. Alongside the stairs I’d generally find a well-worn mud track, which I figured out was sometimes easier to walk or jog up than the uneven stairs. There were also some nice downhill bits – some nice wide flat dirt track which I could fly down, and others that were a bit treacherous with moss and tree roots, and I had to exercise caution. And of course there were uphills – some short and sharp and some longer but not too steep, both of which I would try to run up. The longer steep hills I wouldn’t even attempt to run. I kept my gloves on until about 6km in, and during one of the long steep climbs I had time to take off my pack and put them in there, to save having to carry them. Another reason why the pack was worth having! The course was impeccably marked. I could always see the pink tape in the trees or on the fence to signify that I was on the right track. And there were arrows and ‘Wrong Way’ X signs wherever there might be some ambiguity. This was particularly helpful on my second lap, especially just after passing the start/finish line where Nikki, one of the awesome Race Directors along with husband Phil who also happens to be the man behind Mt Gambier parkrun, was announcing all the runners as they passed by – a lovely touch! As I started my second lap I was on my own, and the route I’d run just over an hour earlier now felt unfamiliar! 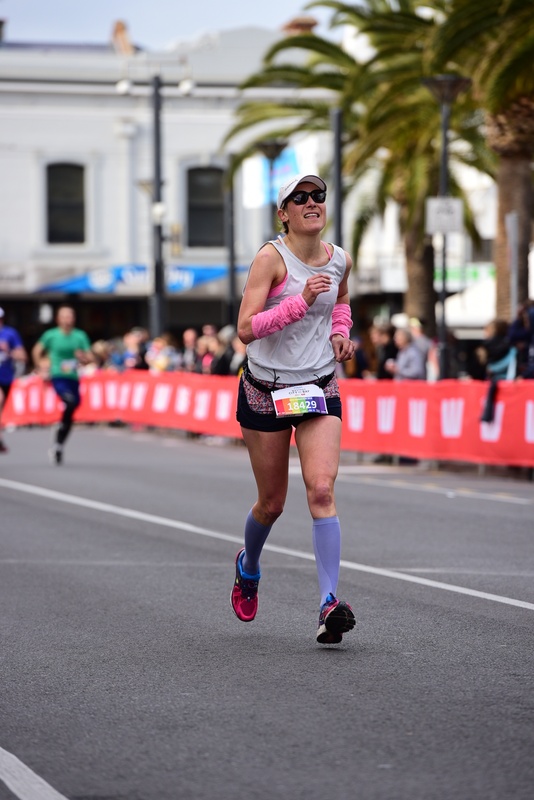 I was a bit confused when I started to see half marathoners as well as marathoners coming back the other way – I hadn’t recalled that on the first lap, but the pink tape let me know I was on the right track! There were plenty of marshals out there as well as frequent drink stations – a very well supported event! FABULOUS volunteers and in a lovely touch, they all got medals too, with special ‘VOLUNTEER’ ribbons. I was pleasantly surprised to reach the halfway mark in just over 1 hour 10 minutes. That gave me roughly a 10 minute buffer for the second lap to still run 2:30. I was expecting to run the second lap slower but not 10 minutes slower, so I was pretty confident. I wasn’t racing anyone else, although every time I passed another woman I did try to sneak a look at her bib colour. There was one girl ahead of me for quite a long time who I eventually passed going up a hill on lap 2 – after I passed her I noted she was a half marathoner but actually I was thinking more of an age group placing than an overall placing! I was one of 7 in my age group so I was hoping for a top 3 placing there. As far as I could tell, an overall podium finish was out of the question! Not long into lap 2 I was passed by Mick, the eventual winner of the marathon, on his final lap. He was well ahead of Howard who ended up finishing second, and in fact Mick was the only marathoner who passed me. He called out to me before he passed me – he must have recognised me from my signature striped arm warmers – and congratulated me on Boston before flying off into the distance! Well, actually I kept him in sight for a time, and was heartened to see him walking up one of the steep hills, but by the time I got to the top of the hill and back on the flat, he was long gone! 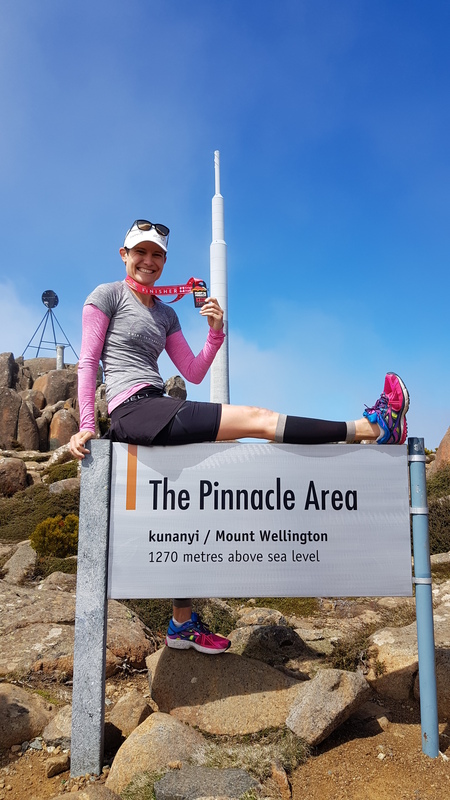 Speaking of race photos, I had decided that on my second lap I would stop for a quick selfie at the Centenary Tower, after which the race was named. However, as it turned out, I didn’t need to, as a photographer had been posted there! 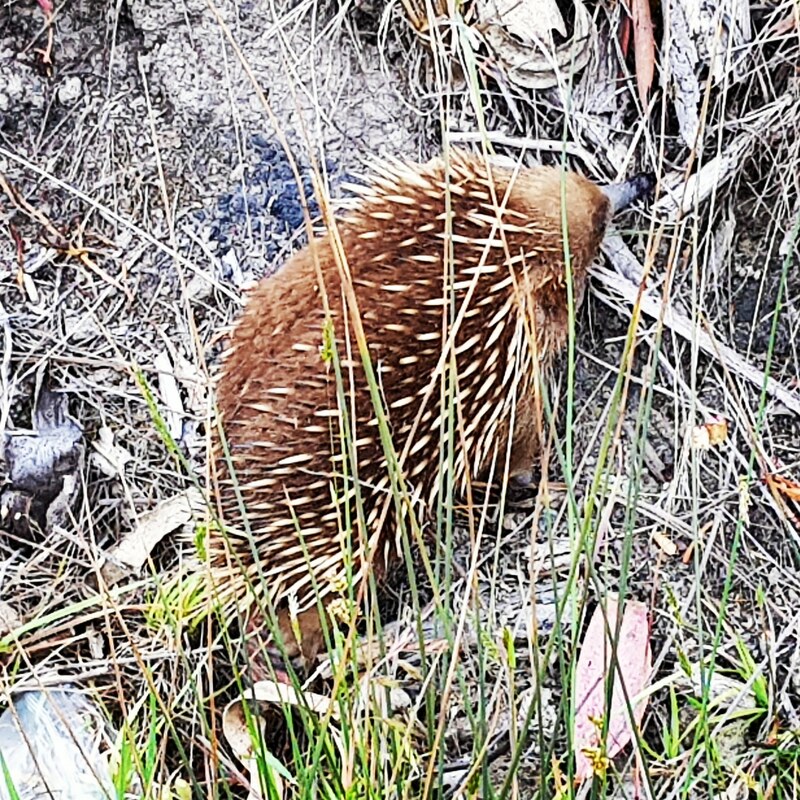 He was asking everyone to stop for a couple of photos – given that it was at the end of a fairly long climb, I wasn’t exactly moving that fast anyway, so stopping was not an issue – I think he got some great shots too! It was all (mostly) downhill from there. I started passing a lot of 10k run/walkers and some marathoners too. With only 1k or so to go, I caught up with Glen who informed me that he thought I was in 6th or 7th place. 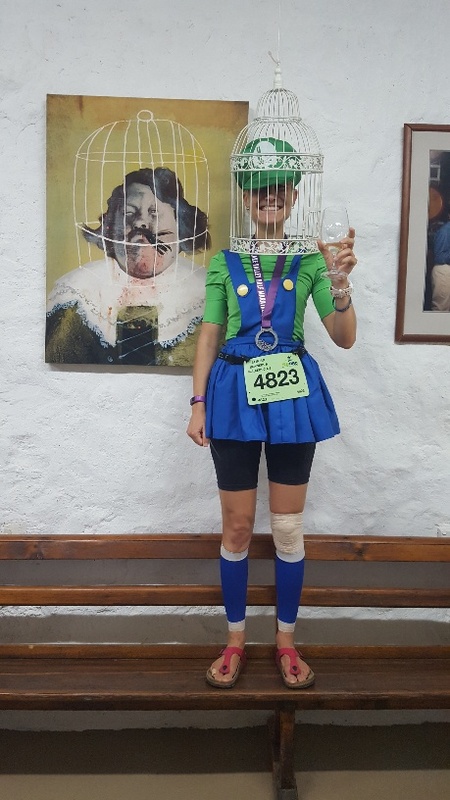 I decided to go for it in that last kilometre and once I reached the 2 girls with the cowbells (who really added hugely to the atmosphere – thanks girls!) I picked up the pace and (politely of course) passed everyone I could, including one familiar face in Ros, who was in the 10k event. Before too long I could hear the finish line festivities and knew I was nearly there! Up ahead I saw a familiar figure in Graham. I realised I would need to pass him so snuck past him to keep my momentum going. He realised who it was and he wasn’t having any of that, so he picked up the pace and practically sprinted past me to the finish line and into the aid station, me giving chase but unable to catch him! After receiving my awesome medal, I went to jokingly have a go at him for making me sprint, and was gobsmacked when he told me he still had a lap to go! I had assumed he was finished! A little later, his partner Vivienne told me she’d seen him a little further up the road and he’d said he was regretting the sprint finish! I was looking forward to exacting some ‘revenge’ when he came back on his final lap! I had finished in just over 2 hours 20. In fact, when I later checked my results, I had managed a marginal negative split by around 16 seconds (I guess, in part, I have Graham to thank for that!) – well beyond expectations! I ended up in 5th place out of the women – less than 5 seconds behind 4th (thanks again to Graham!) and less than 2 minutes behind 3rd place! And I did manage to place first in my age group too – all of that was just a bonus. More importantly I had a most enjoyable run, got out of it unscathed and did a surprisingly good time considering my lack of recent trail running! I had started to think I just wasn’t cut out for trail running, even though I really enjoy it! I don’t imagine I’ll ever be a podium contender but to be able to go out there and do reasonably well and enjoy every minute is encouraging! 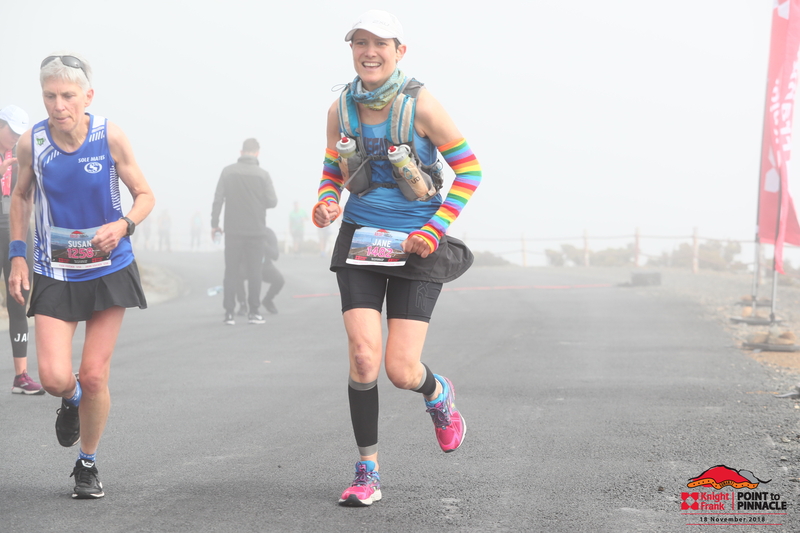 Not long after that Karen and then Wendy finished, both happy with their runs – both under 3 hours. Daryl was still out there and unfortunately got caught up in a pretty heavy shower! Eventually we saw him coming in the distance and gave him a great reception as he finished! 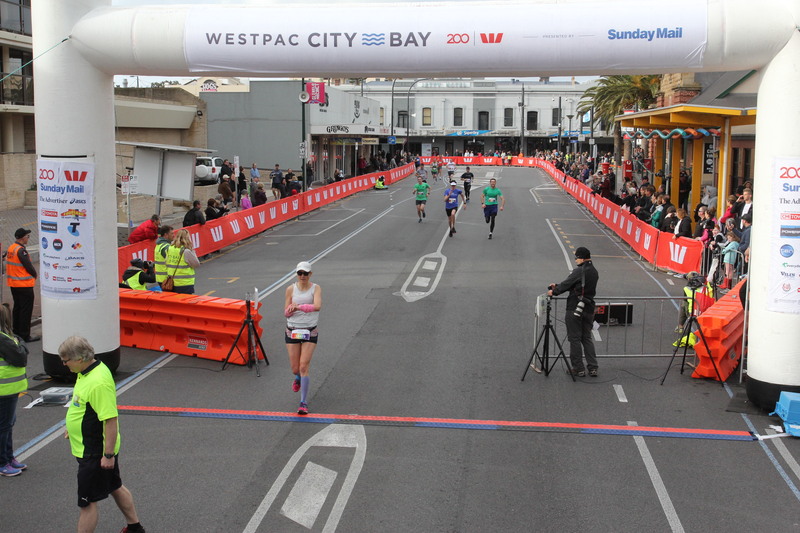 Not long before Daryl, Kristy crossed the line, also to a great cheer, and she was also very happy with how she went! I decided to head along the course to meet up with Graham, being careful not to go near any of the timing equipment, given that I was still wearing my race bib! It wasn’t long before I saw him coming, quickly passing my bib to the marshal to look after for a minute, before chasing Graham to the finish! Graham still managed a jump at the finish line despite me making him work for it! (That’s me in the grey hoodie behind him!) Thanks to Howard for this awesome shot! With ‘nemesis’ (his words!) Graham! We were all getting pretty cold by then so headed back to the house to get into some warm clothes and defrost! And of course, eat all of the things! 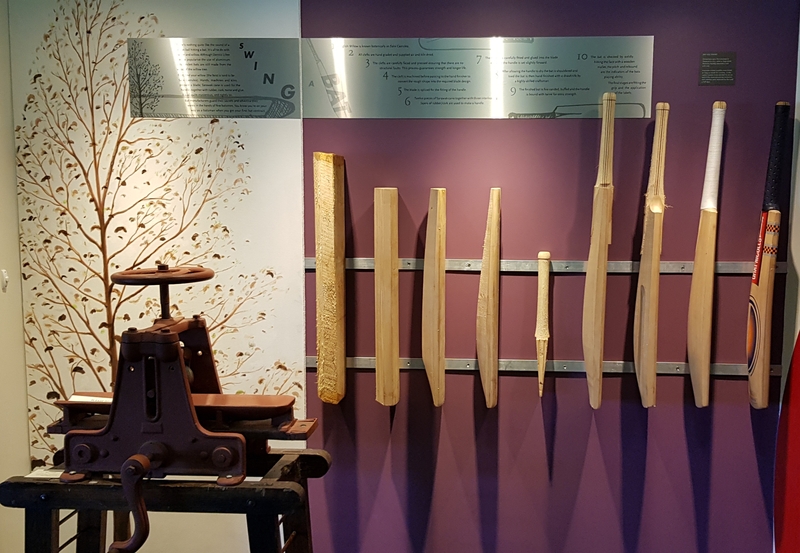 Unlike most of the Adelaide people we opted to stay another night in the Mount and have a leisurely drive back on Monday – including another winery stop of course – this time at Wynn’s! On Sunday afternoon we went for a drive to Port Macdonnell for chips by the sea while watching kiteboarders. Karen and I had a disagreement about feeding chips to the circling seagulls (she was pro, I was very anti, and of course I was right!) before heading back to town for the perfect recovery meal, takeaway from Gourmet India and red bubbles from Majella! Bling and bubbles. Need I say more? 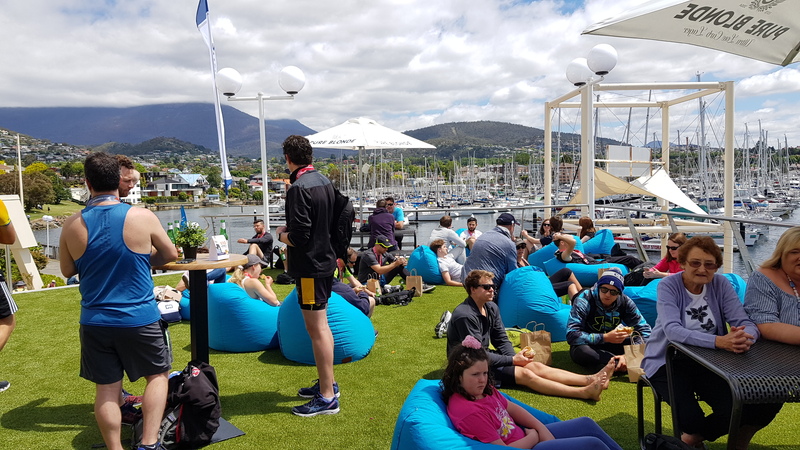 It was a fantastic weekend all around – and just a wonderful, scenic, friendly and enjoyable event. I hope to be back again to do it all again next year and would recommend it to anyone who loves trail running! 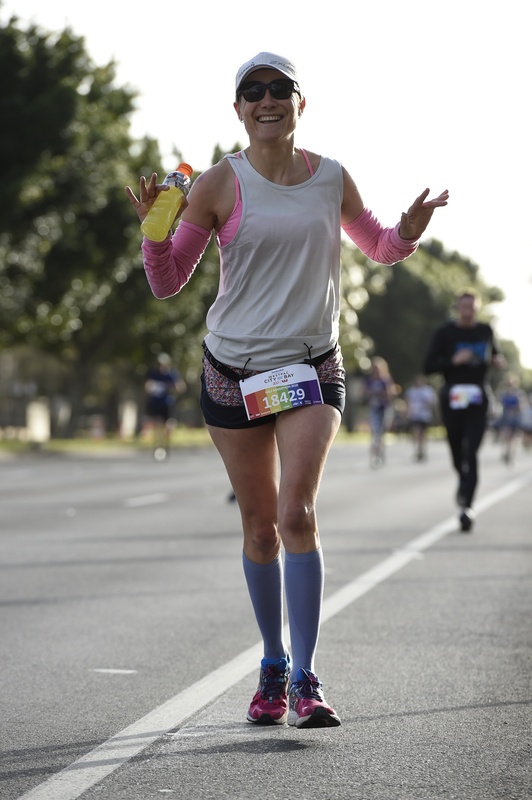 I won’t do the marathon – 4 laps of that course is just not for me, but I would absolutely do the half again! Congratulations and thanks again to Phil, Nikki and all the amazing volunteers for making it all possible! This week, we go back to where it all (ie this blog) began! 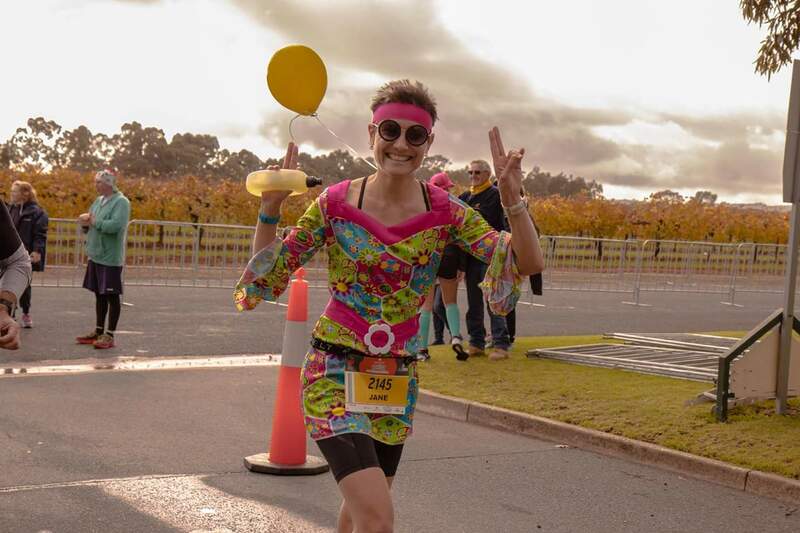 2 years ago I ran the Barossa Marathon and wrote a little report about it, which I posted on my Facebook page. The positive feedback I received about this report (in some cases from people I hadn’t even met before) in the subsequent days, led me to create ‘Random Thoughts and Race Reports’ and I guess you could say the rest is history! Anyway, back to Barossa. 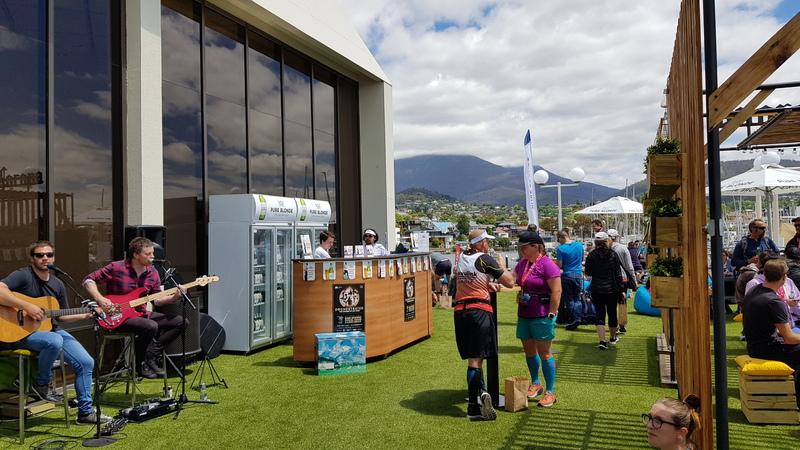 Some months ago, knowing that it was 6 weeks after Boston and 2 weeks after I got back to Australia, I volunteered to do the 2 hour pacing gig for the half marathon. 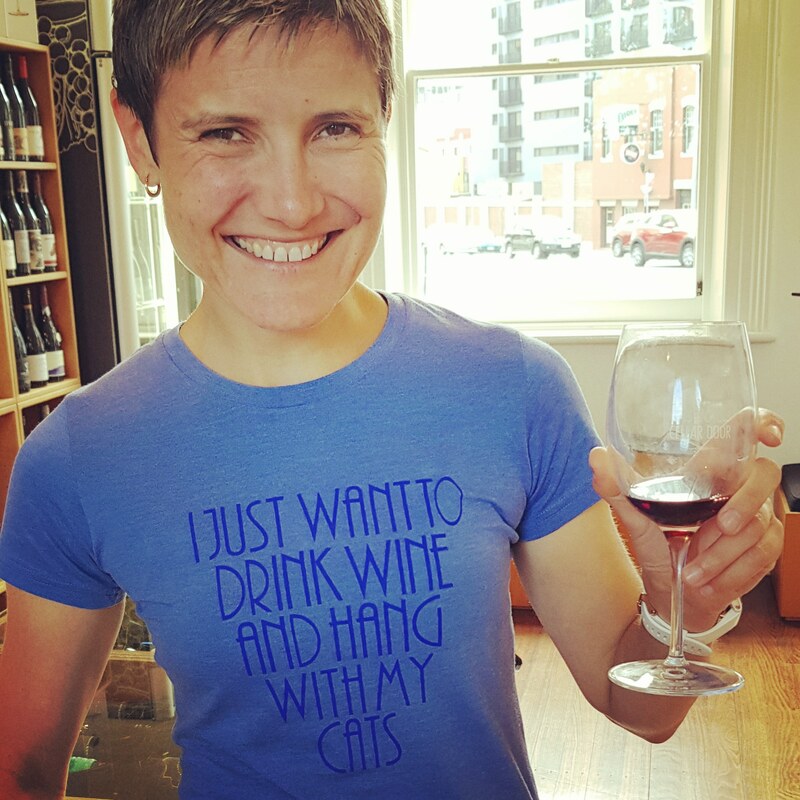 I figured, I wasn’t really going to be in ‘race shape’ and I find pacing really enjoyable and rewarding, so it would be a great way to be involved! 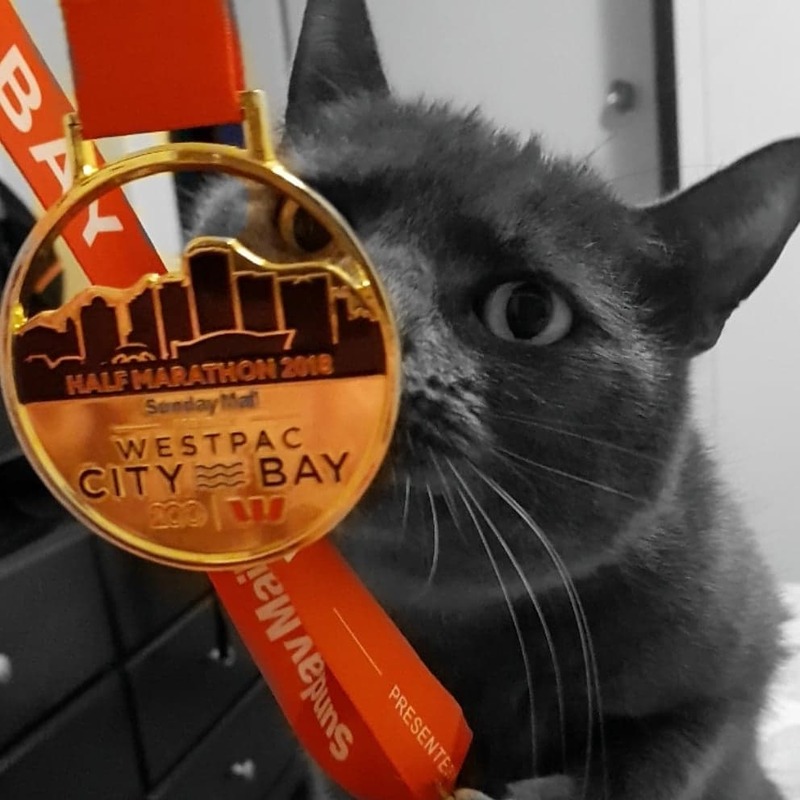 Up until last weekend, I hadn’t run 21.1km since Boston, so I was actually a bit unsure if I could even run a sub 2 hour half, let alone pace one! So I went out and ran about 10 laps of the Uni Loop (2.2km) and came in about 4 minutes under the 2 hours. I wasn’t trying to push hard but by the same token I wasn’t trying to run ‘slow’. I was just running at the pace I was comfortable with. So that pretty much confirmed to me that I could do the pacer gig! Ideally you want to be able to run about 15 minutes faster than the time you’re pacing. I don’t think I could run 1:45 at the moment but I was definitely confident I had this! 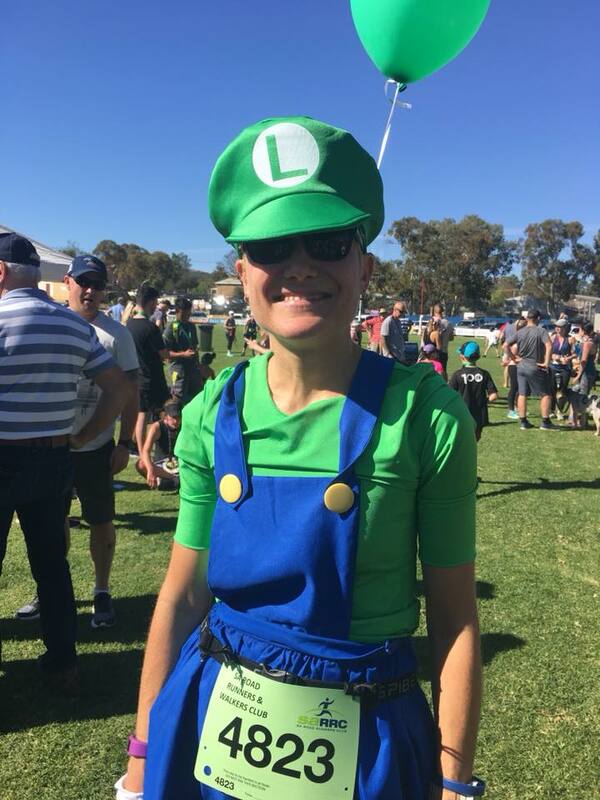 I bought a new costume to run in – ostensibly to make me easier to spot for those trying to run with me, but just quietly because I kind of enjoy dressing up in wacky outfits! This one was a psychedelic hippie dress, complete with belt and headband. I even found a pair of sunglasses which were left at my house a few years ago but never claimed, that fit the outfit perfectly – and my yellow Boston calf sleeves were a perfect match! Underneath was another brand new item, my new 2XU compression shorts. The weather wasn’t looking too good! There was a lot of rain overnight (both at home in Adelaide and up in the Barossa) and more rain forecast for race day. 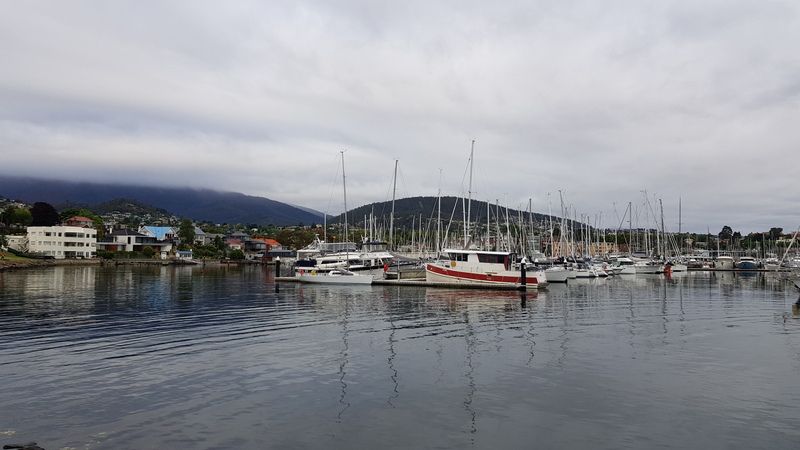 I was not looking forward to the idea of running in the rain – mostly for the reason that it would slow me down, and I couldn’t really afford to lose too much speed! 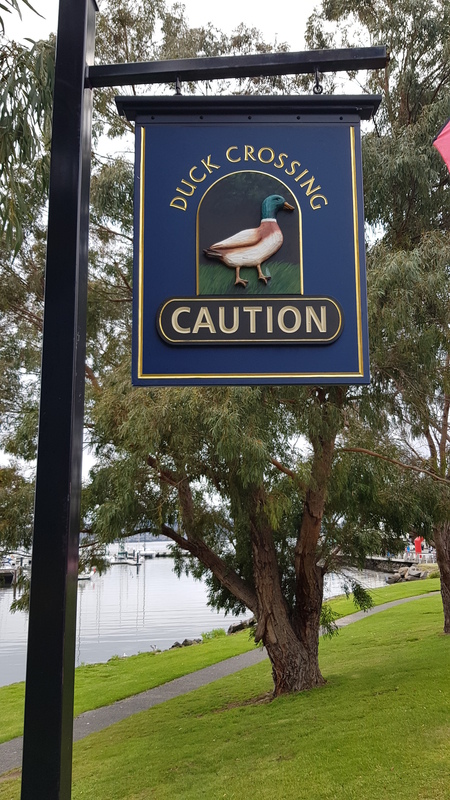 Fortunately, although it was cold (and colder when we got to Tanunda), the rain appeared to be holding off. Voula and Beck wishing Gary all the best! 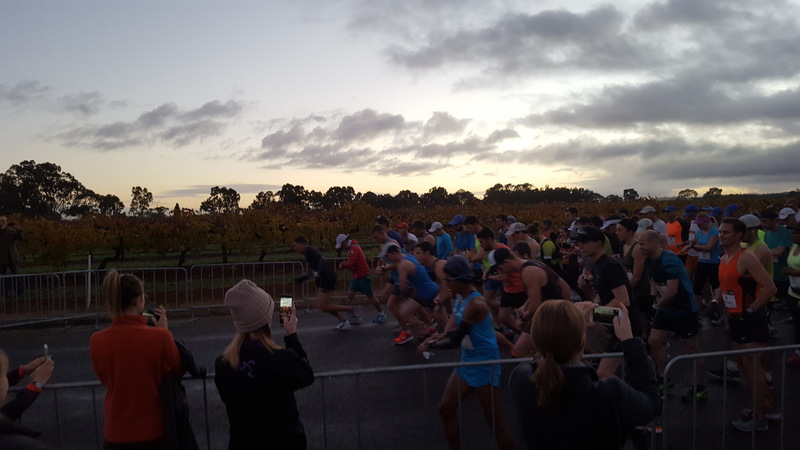 And they’re off, in the 2017 Barossa Marathon! The next 45 minutes went very quickly – just enough time to collect my bib and pacer balloons, stand in a lengthy toilet queue, then attempt a contortionist routine in trying to change out of my warm multiple layers and into my race ‘kit’ within the confines of a small toilet cubicle. Once that was done it was pretty much time to go to the start line! Luckily I had Beck there to take my bags as I probably would not have had time to getto the baggage tent! I was one of 3 pacers in the half. We had Bryn doing 1:30 (his first pacer gig) and Jim 1:45 (Jim’s a veteran pacer and pretty much has the 1:45 slot sewn up!) with me doing my favourite, 2:00. I wasn’t sure exactly where to stand, as I couldn’t see Jim. In the end I just chose a spot well behind Bryn, and behind a few people I knew were planning to run sub-2. It didn’t really matter that much – 21.1km gives plenty of time to sort out pace and position! 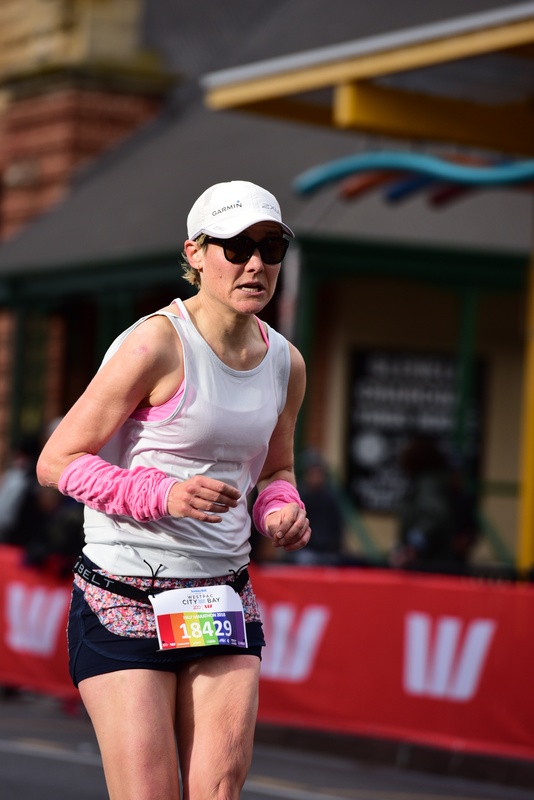 For those who aren’t familiar, the role of a pacer is to run as close as possible to a specified time, and people who want to run that time (or thereabouts) just need to stick with the pacer and don’t need to worry about their own pace. It is particularly useful for runners who don’t use a GPS watch. As a pacer, there is definitely a bit of pressure but it’s also really enjoyable and rewarding to see your pace group achieve their goals. I know I’m going to forget some people so apologies if I do! There were a lot of runners either with me or just ahead of me. Michelle was trying to stick with me as long as possible but her main goal was a sub 2:15 to qualify for Wonderland trail run. Eventually she dropped off my ‘bus’ but she got in well under her goal time! Regular running buddy Nat was with me for a while and ended up finishing just a few minutes behind me, saying that she really enjoyed the run. 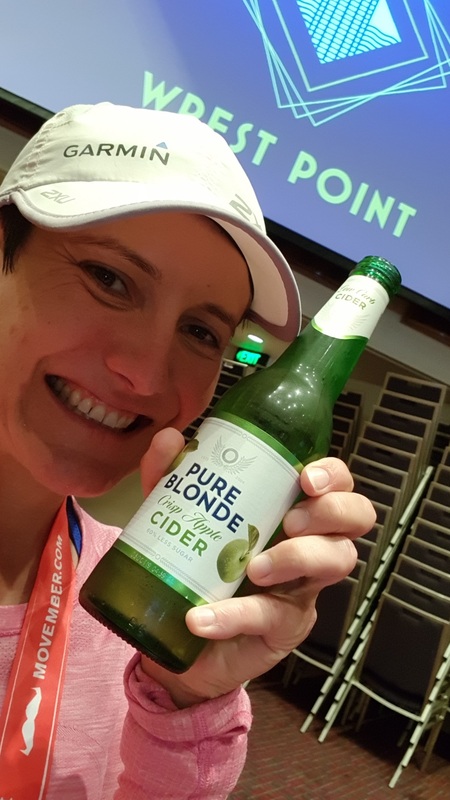 Sally thought she would be running just ahead of me but ended up smashing out a huge PB and on top of that won 2 bottles of wine in the random prize draw! Others running ahead of me included Gary (different Gary from the one we’d seen off in the marathon! ), Victoria, Ali and Peter. There were definitely a few PBs among that lot – they didn’t need any pacing help from me! 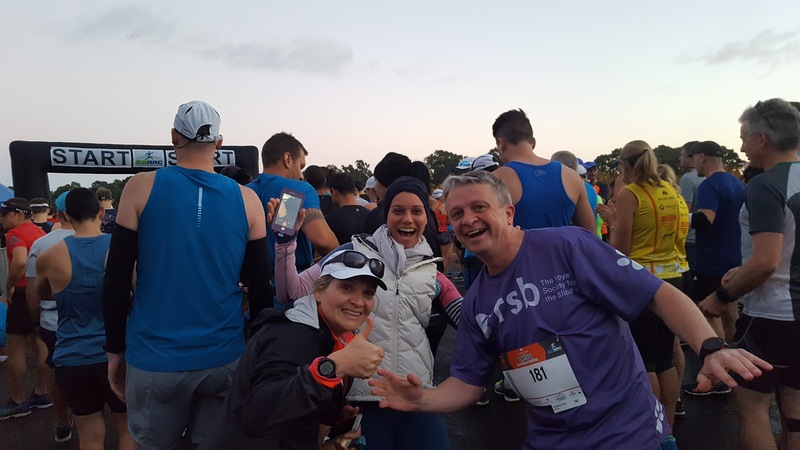 With me pretty much from the start were Brianna, fresh off a PB at the Paris Marathon, and first time half marathoner Kathryn from Brisbane (who was unaccustomed to the cold weather that we turned on for her!) Brianna was hoping to go sub 2 but hadn’t run that far since Paris, and Kathryn was just hoping to stick with me as long as possible – she’d done a half distance in training, in about 2:10. Due to the staggering of the start times for the marathon, half, 10k and 5k, there were never any issues with congestion. We didn’t see the 5k or 10k runners at all (in fact, I never even saw race ambassador Jess Trengove, who won the 10k race) but we did get to see the marathoners on multiple occasions, and due to the ‘out and back’ sections we also got to see all the half marathoners (over 500 finishers!) – from the leaders all the way to the back of the pack! Pace-wise it took me about 3km to hit my goal pace of 5:37 – 5:38 mins per km. 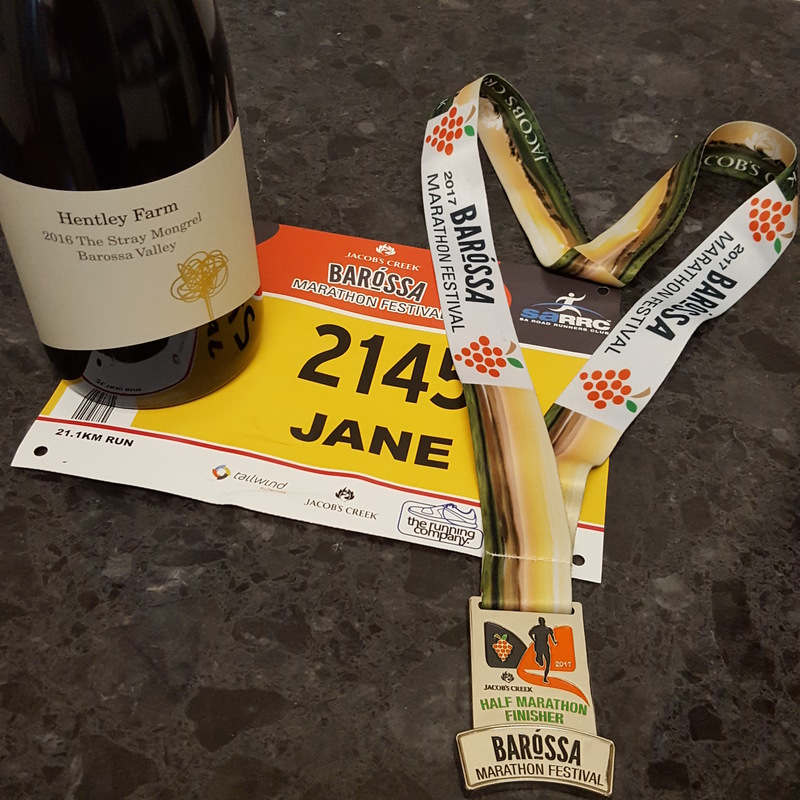 I found Barossa the easiest out of all the halves I’ve paced – due to the flat nature of the course and the favourable weather conditions. Once I hit my pace I managed to hold onto it. Towards the end I did a few calculations so I would come in JUST under the 2 hours, so I did need to slow down just a touch! I think with about 5km to go, Brianna took off but Kathryn was still with me! She was determined to stick with me until 16km, then it would be ‘just a parkrun to go!’ Personally I don’t find that comparison super helpful but it certainly works for a lot of people! Eventually we reached the ‘parkrun turnaround mark’ (2.5km to go) and it became apparent that Kathryn was going to get under 2 hours! 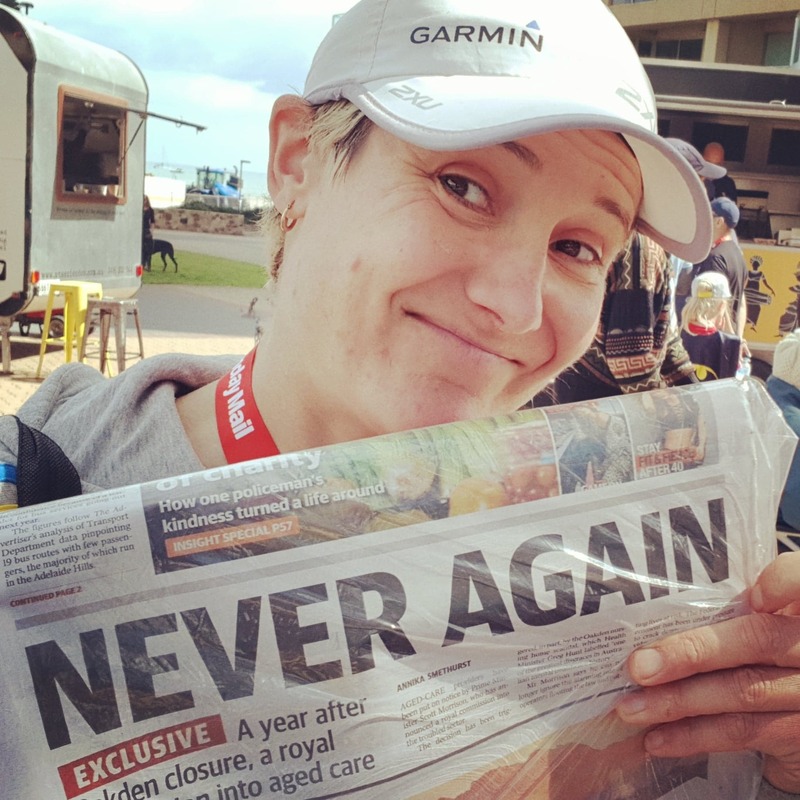 It was kind of like a proud mother bird moment for me when she took off with around 1km to go – I had to hold onto my pace so couldn’t go with her but I was thinking ‘Fly, my pretties!’ as each runner left my ‘nest’! There were a few other runners around me who were looking good for sub 2 – some just in front and some just behind. 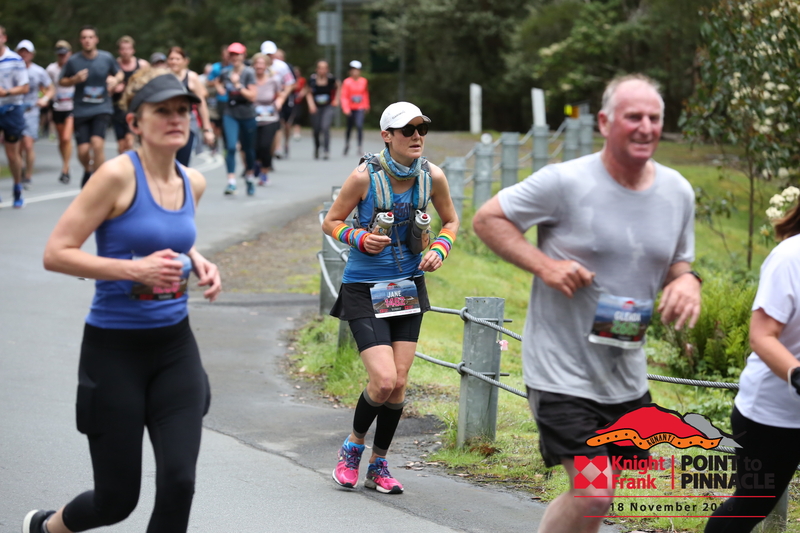 One guy, Gerard, had not long given up smoking and was on track for a PB (and finished just seconds behind me) and regular running buddy Deb was ahead of me for a good portion of the race, but stuck with me after I passed her, and also came in under 2 hours. Another girl, whose name I didn’t get but who was wearing a Step Into Life top and not wearing a watch, was also hoping for a sub 2 and I’m not sure if she finished ahead of me or behind me but she came up to me afterwards and told me she got the sub-2! And then there was another regular running buddy Fiona, who was determined not to let me pass her (jokingly telling me I was going too fast) and ended up finishing about half a minute ahead of me. I crossed the line with 1:59:42 on the clock. My official time was 1:59:18 which I was pleased with! Just before the finish line – pic courtesy of Dave Munro. And the timing was perfect because not 5 minutes after I finished, the heavens opened! Unfortunately that meant missing the presentations for the 5, 10 and 21.1k as I hightailed it back to Beck’s car to get changed into some warm, dry clothes and then head back to see our friends finish the marathon! Luckily I had time to pose for a pic with Kathryn before the downpour! There was a large group of runners around the 3:30 pacer (I think the only pacer in the marathon) including Coralie, Rebecca and Jenny. Not long after that were Carrie, Amanda and Leon (doing his 347th marathon for the year, by my calculation!) with a small gap to my 2015 Barossa running buddy Kay and fellow 2017 Boston Marathon finisher Graham! Then came a few more familiar faces, Peter and Dave, but for me the best moment of the day was seeing Gary finish. 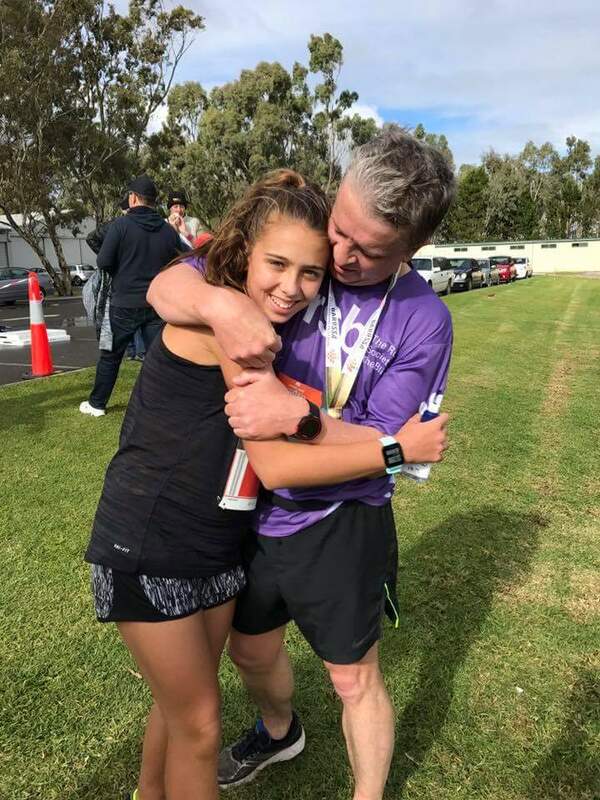 Gary’s daughter Tahlia had run the 10k, and as I approached the end of my half, I saw Tahlia running back to meet her dad. We waited what seemed like ages at the finish (but it wasn’t actually that long – we were just cold and in need of wine!) until we saw Mark, who had been running with Gary when I’d last seen them, so we knew Gary couldn’t be far behind! And sure enough, around 30 seconds later, there was that distinctive purple T-shirt! 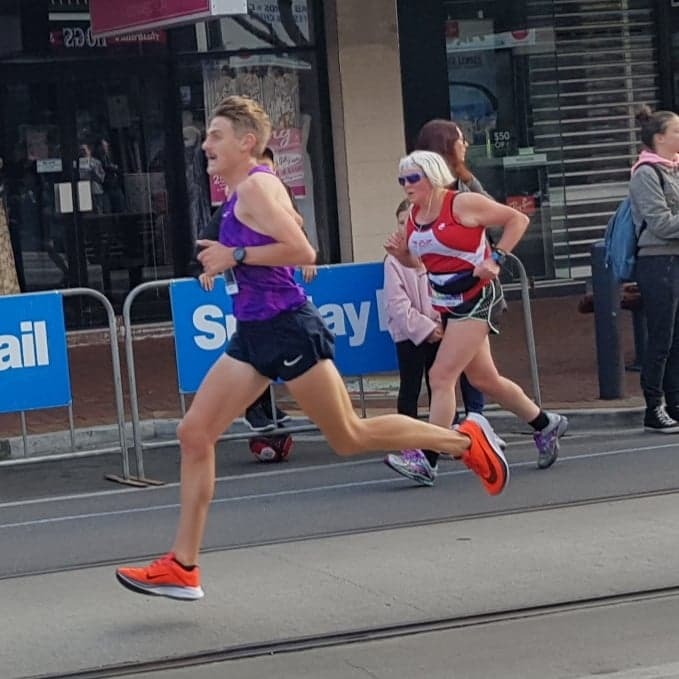 We gave Gary a huge cheer and I think he might have been a bit fired up (after pretty much crawling across the finish line in his first marathon at Adelaide last year, he had, as he put it, ‘some running demons to vanquish’) and was yelling and cheering and high fiving! It was definitely a highlight for me and I’m sure it was a very special moment for Gary and Tahlia! Proud father/daughter moment! 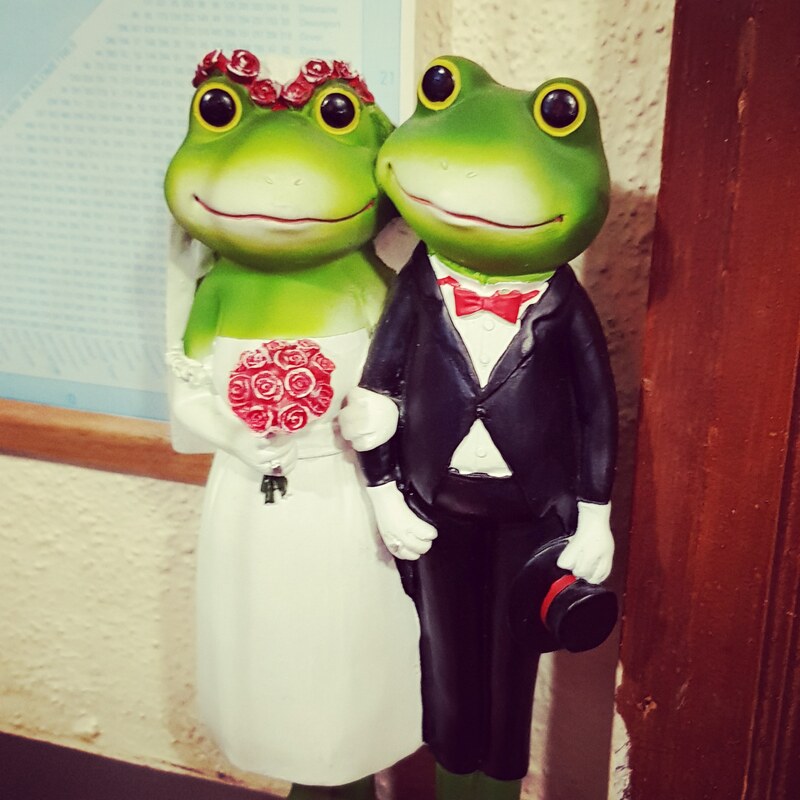 Thanks Voula Nisyrios for the pic! As we were getting cold and Beck had post-wine family commitments, we left pretty much straight after Gary finished, for a well earned wine tasting at Hentley Farm (I tasted 9 wines and liked them all – unfortunately the budget would only stretch to one bottle – I went with a Grenache Shiraz Zinfandel, mainly because I’ve never tried or even seen that blend before! 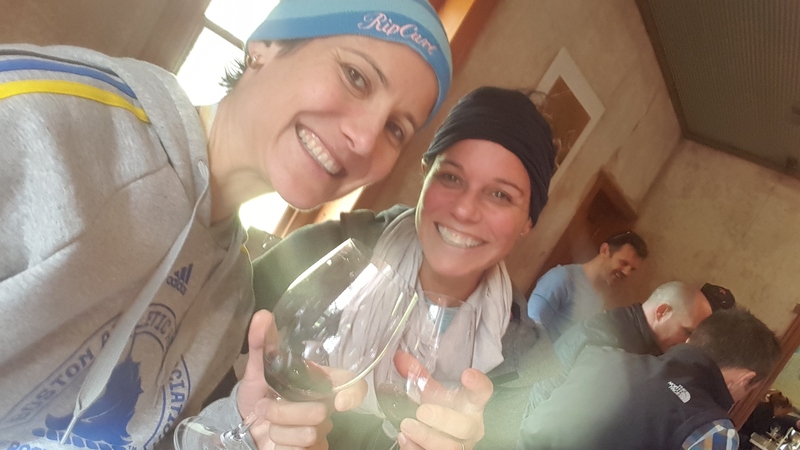 #willrunforwine – a very enjoyable tasting at Hentley Farm! So once again, SARRC have put on another excellent event – the weather wasn’t kind to everyone (the marathoners and some of the half marathoners behind me certainly copped it a lot worse than I did) but it was ideal running weather for me, the volunteers were fabulous as always, the spectators were great, and my fellow runners were always friendly and supportive! 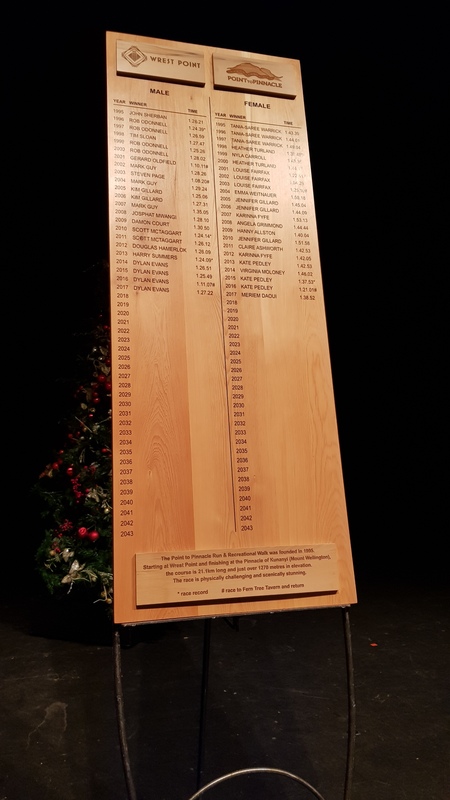 Thanks to everyone involved in making this such a great day! And especially to Beck for chauffeuring me – I owe you one! A nice red and some sweet bling – what more could you want? ​I’ll start by saying, I am prone to exaggeration, but that would have to be right up there with the hardest races I’ve ever done! but by doing that, you will lose a lot of passengers on your ‘bus’ early. You also want to make sure you finish under (or marginally over) the set time, but not by too much. It is a delicate balance! particular outfit. 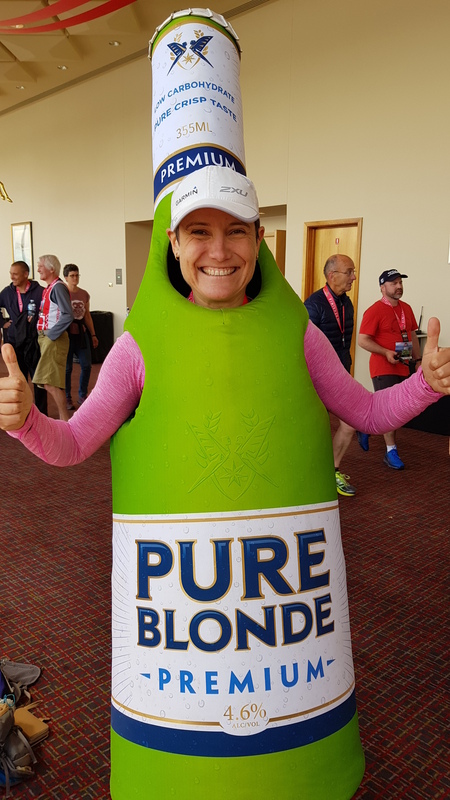 Most of my other crazy outfits have at least passed the parkrun test! and fortunately it was a warmish day on Saturday so I hung it out on the line for a few hours to dry. The devil dress was a bit short so I went with an extra red tutu underneath for a bit more modesty, and I also wore Skins shorts for comfort and more respectability! I went down to McLaren Vale on Sunday with regular running buddy Jim who was also running the half, hoping to be under the 1:30 mark. Therefore it was unlikely I’d be seeing him during the race, other than those out and back sections! 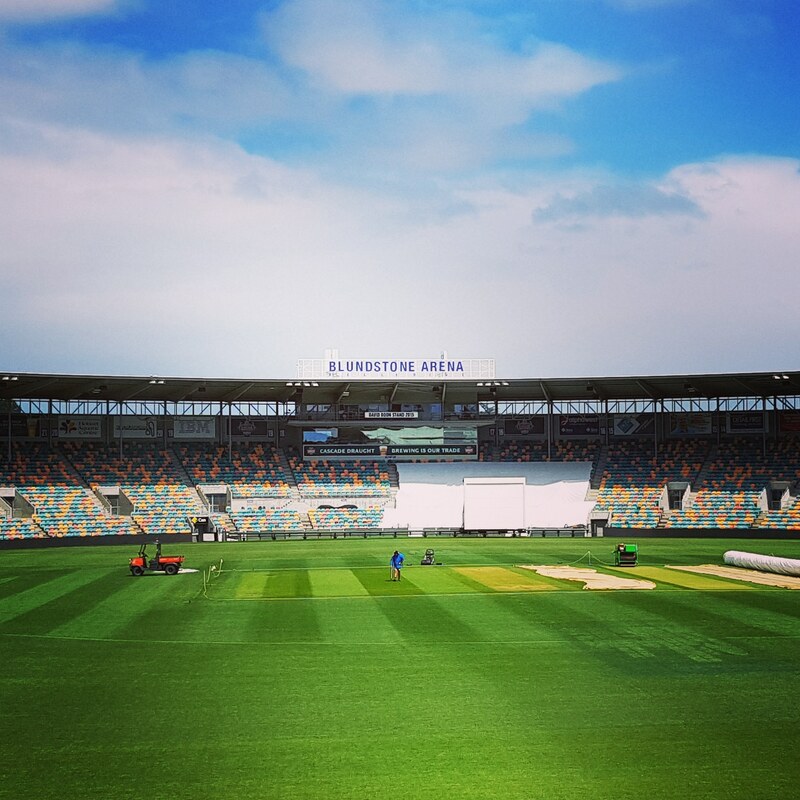 everywhere – bollards had blown over and marquees looked in danger of becoming airborne. This was not going to be easy! and I ended up pinning the bib to the top of the skirt. I thought it would be a good idea to pin it through the dress to my Skins shorts. And it probably would have been a good idea. But I had decided to get everything organised BEFORE my loo stop. Bad move! annoying at the best of times! 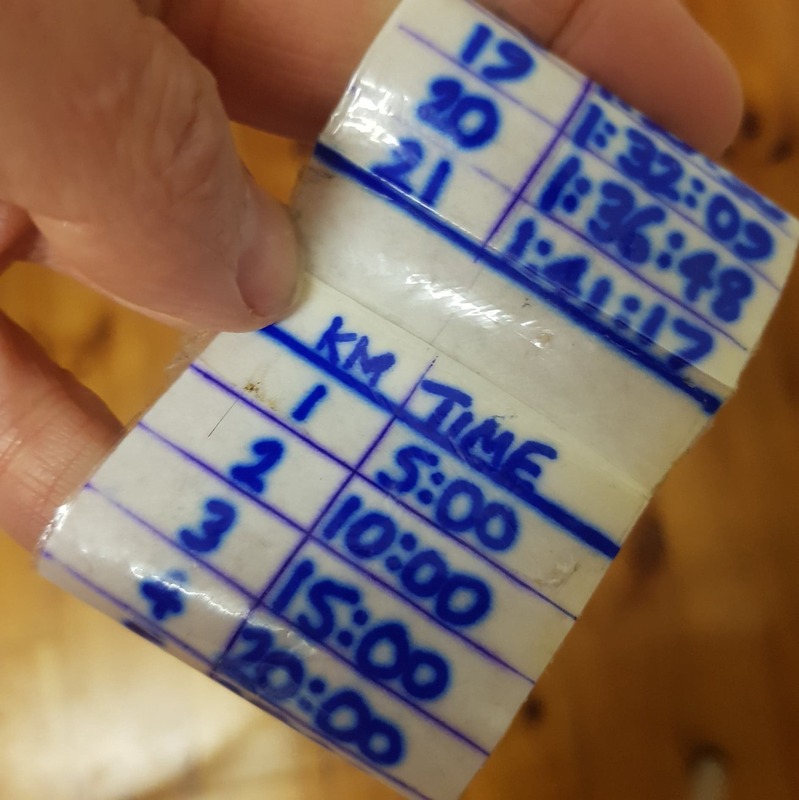 Probably more annoying for those running behind me though – I’ve only run WITH a pacer once before, at this year’s Gold Coast Marathon, and I remember needing to give him a fairly wide berth if I didn’t want to be eating rubber! 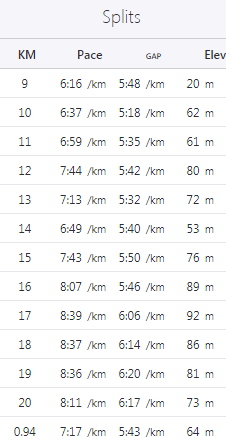 on earth would I be able to maintain a consistent pace when some of it was going to be into a very stiff (40+ km/hour) headwind (and probably also uphill)? I wasn’t even sure if I could run under 2 hours in these conditions! the general inaccuracy of GPS devices, and I would be having to do some mental maths as well to make sure I didn’t miss the mark. my devil horns – possibly not a problem I’ve ever had in a race before! I think it took me about 5km to get up to goal pace, what with the crowds and also intermittently running into the wind. I was pretty happy with how I managed to maintain that pace after that. her on one of the out and back sections, well ahead of me, I threatened to stab her with my pitchfork if I got too close! I think that was a good motivator! When I was running into the wind I ended up pulling my balloons down and holding onto them which made things a bit easier but as a result I wasn’t able to swing my arms to give me a bit of a boost. might ‘accidentally’ pop, but no such luck – one of them did develop a slow leak though. I can do that in 25 minutes”! That would make me a bad pacer! of the random prizes (I didn’t!) and have a coffee and chat with friends. 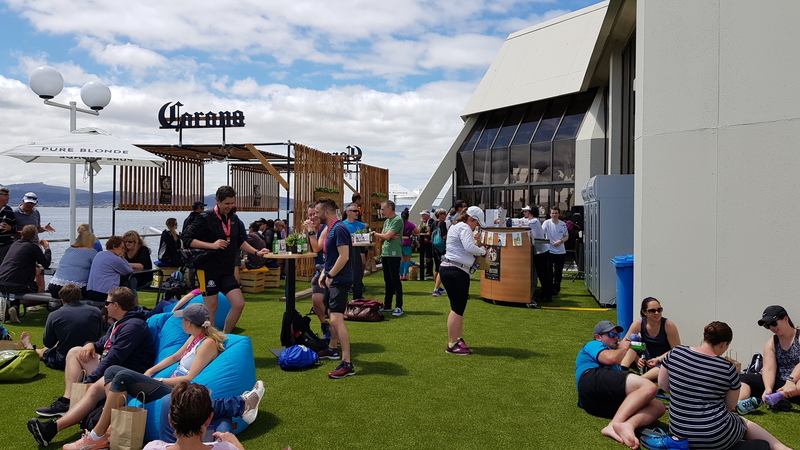 and I am always grateful that people are willing to give up their time (and in some cases travel a fair way – McLaren Vale is about 45 minutes from the city) to allow the rest of us to enjoy what is always a fantastic event. You guys all ROCK! If you get the opportunity, I highly recommend pacing as a great way to give back and to test yourself in a different way! It is so rewarding to hear from people you’ve helped, even those that you didn’t even realise were on your ‘bus’! Oh and Bec did get her sub 2 hours, a massive PB and she did credit my pitchfork threat as a motivator! And Sheena just scraped in too! 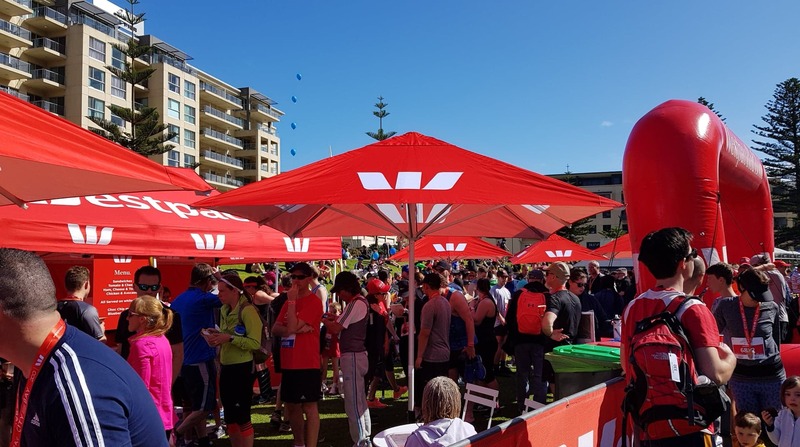 Well done to EVERYONE who ran in one of the 3 events – the 5k, 10k and the half. It was a brilliant event and a fantastic day despite the tough conditions! And massive kudos to anyone who somehow managed to pull out a PB! Sunday was my 3rd Greenbelt Half. My first, in 2014, was my second ever half marathon and a huge PB for me, 1:42:43. Last year I missed out on a PB by only 10 I seconds. I couldn’t see where I could have gone any faster, so I was happy with that time. Since then I somehow beat that PB during the Masters Games – 1:37:54. I’m not quite sure how I managed to do that time especially on a 4 lap course that wasn’t exactly flat. I’ve sort of discounted that time as a PB as I currently can’t see how there is any way I’ll beat that time! My new time to beat was my 1:42:27 at Clare just a few weeks ago. 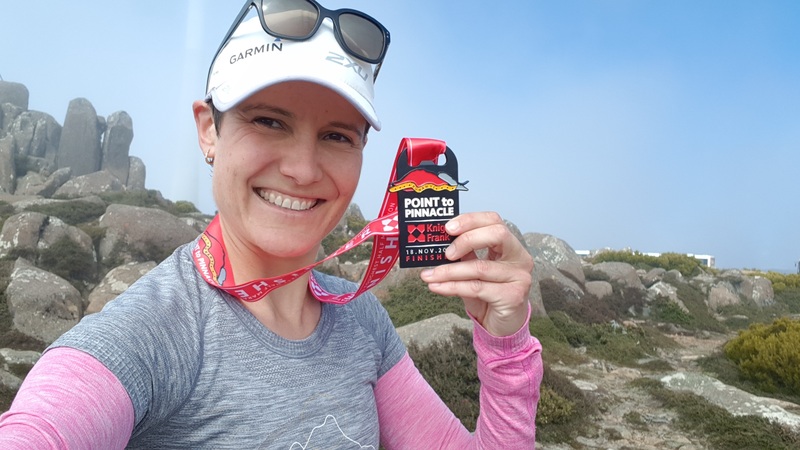 Clare being a notoriously challenging course (not the most challenging ever but 10+km uphill followed by an almost undetectable downhill back half does not make for a great PB course), I was confident that anything I could do at Clare, I could do better at Greenbelt! I had recovered well from the previous weekend’s 24k trail race at Cleland. In the days leading up to Greenbelt, my hamstring tendon issue that had been bugging me since the 100k in January, miraculously disappeared (well, temporarily at least). 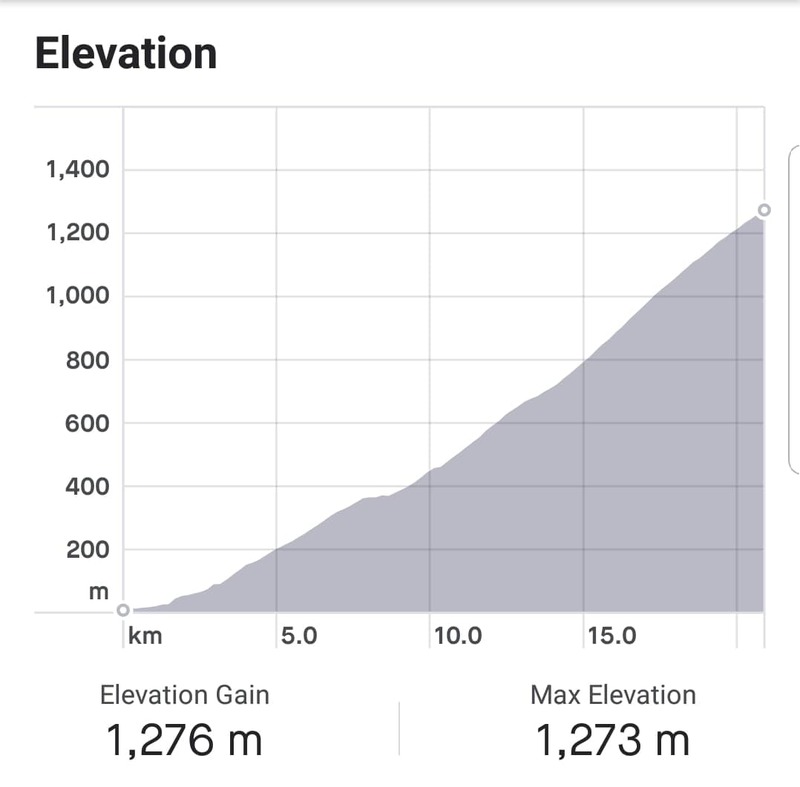 I did a hilly run with my UTA100 mandatory gear on Tuesday, a now traditional fast flat run on Thursday, and a gentle (somewhat soggy) ‘jogette’ on Friday morning. 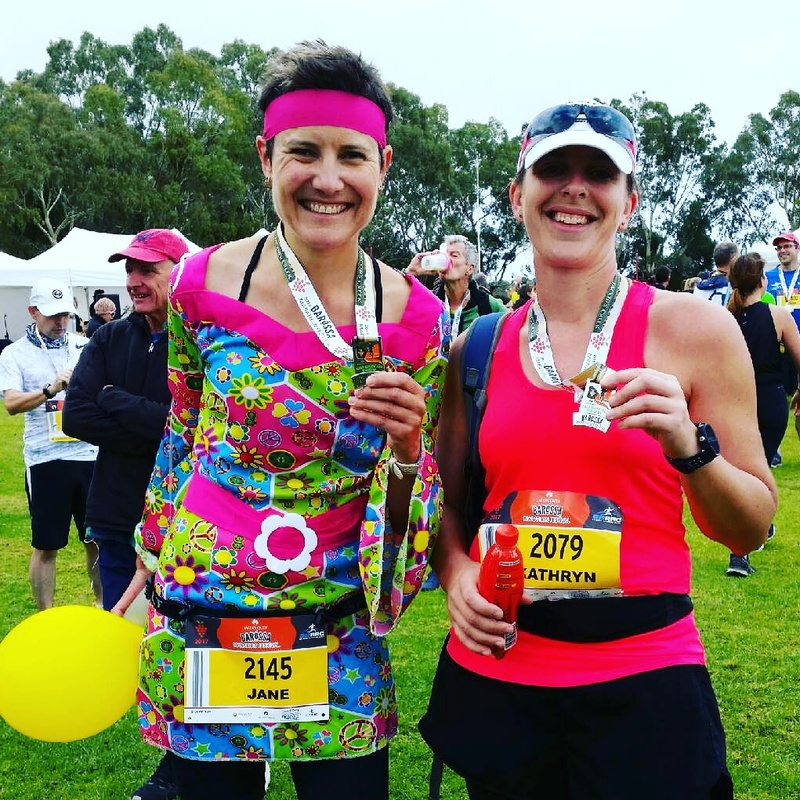 Several weeks ago I had planned to make Greenbelt an ‘out and back’, running from the start at the top of the River Torrens at Athelstone, to the finish in the city at Pinky Flat, and then donning my UTA backpack and running back up to Athelstone. No, hear me out, there was method in my madness! A fast, downhill course known for being good for PBs would be an ideal marathon training hit-out. From memory I was due to run about 30k as part of my Gold Coast training plan. I wasn’t too concerned about distances at this point as I was committed to events. Besides, a hard half marathon race is equivalent to a longer training run in terms of training effect. However, there was something else to consider, and that was the small matter of a 100km ultra in 2 weeks. I may have mentioned that before. Well don’t worry, you’ll be hearing a LOT more about it in the next few weeks and beyond! To get more ‘time on feet’, the run back up to Athelstone would be an ideal solution. Plus I’d be wearing my race vest, which I’ve run a few 10k runs in, but 21k would be better for ultra training. AND, I could have a bonus sleep-in on Sunday – rather than having to get to Pinky Flat to catch a bus up to Athelstone for the start, I could drive straight to Athelstone. Apart from it being a bit insane, this plan was thrown into disarray when Adelaide United qualified to host the A-League (football/soccer for the uninitiated) Grand Final on Sunday afternoon. Running Greenbelt, waiting for the presentations, then the slow plod back up to Athelstone, would mean I’d really be pushing it for time to get home, showered and on the bus back into town for the big game. I found a compromise. 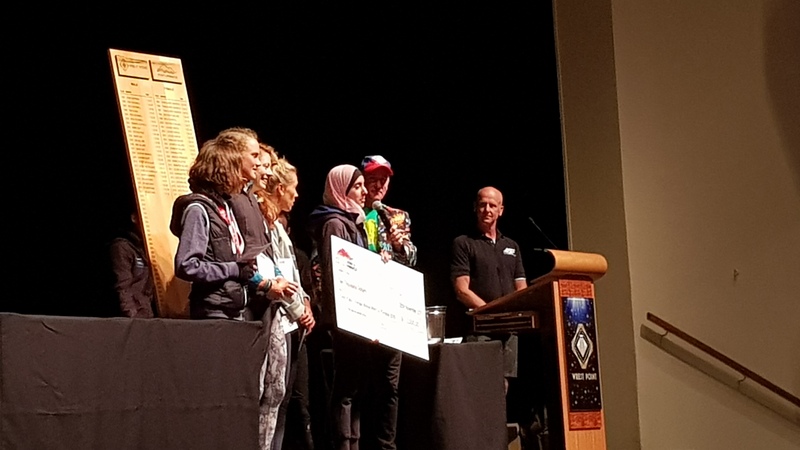 Beck was also running Greenbelt and lives near me, so I would get a lift with her to the city, leave my backpack in her car, bus it up to Athelstone, run the race, smash out a PB, see the presentation, don the backpack and then run the approximately 8km home. With a short warmup before the race itself, that would make 30km all up. A pretty good day at the office, incorporating training for both a marathon and an ultra! I had to carefully consider my race day outfit. I wanted to run in one of my South Australian Road Runners Club singlets (as I had at Clare), as I wanted to fly the SA flag at Gold Coast and needed to train in the top I would be racing in. I also needed something that would be comfortable under the backpack on the way home, so that meant no metal bra clips (spoiler alert – this would lead to chafing and probably tears). Although my ‘wounds’ from Cleland had healed up nicely, the graze on my hipbone was still causing me some trouble and was in the MOST inconvenient spot, I still couldn’t wear jeans comfortably even by Friday! 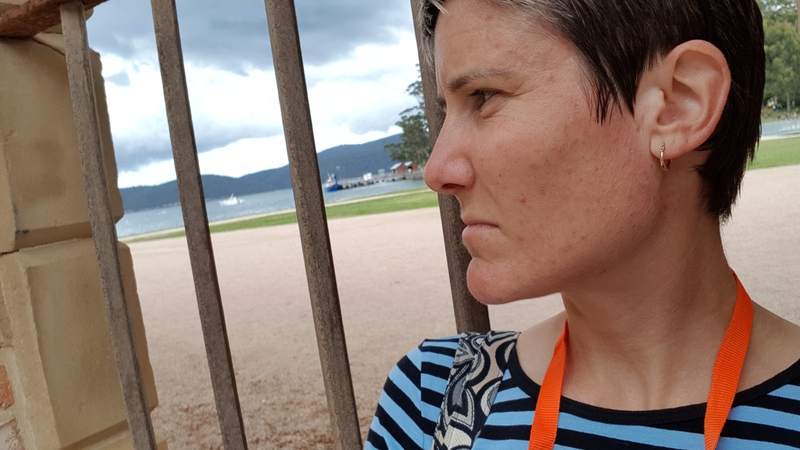 (On discussion with a colleague during the week we decided that rather than a graze it was probably actually a friction burn from my clothing – that would explain how it happened with no damage to my clothing!) I therefore had to pick shorts or a skirt that would not rub in that area! During the week I had bought some 2XU compression socks which I had tried on and LOVED. And they were such a pretty shade of purple! I was SO keen to wear them for Greenbelt! However sanity prevailed and I decided not to take the risk of trying something brand new on race day. I went with the old tried and tested Compressport compression sleeves. Maybe I will wear them for UTA100 and/or Gold Coast but I will definitely be road testing them first! On Saturday night there was some pretty wild weather, mostly strong winds with a bit of rain. Not exactly ideal conditions to run a PB! On race day I got ready as usual as well as preparing my race backpack for the run home. Beck picked me up at 6:15 and we made our way to North Adelaide to catch the bus to Athelstone. I pointed out a girl in front of us as we walked to the bus (she ended up getting on the bus in front of ours) and said, “See that girl there? She’s gonna win it”. It was Micarla, who in the past 4 weeks had won both the Clare half and the Cleland 24k. We arrived at Athelstone Primary School in plenty of time and had to make the tough choice, toilet first, or warmup? We decided on the former, and it was a good choice, because the toilets were already struggling to flush (presumably not used to 800 people using them in the space of an hour) and were likely to get worse as the start approached! The sky was looking pretty black and it seemed inevitable that it would rain on our parade at some point. Beck and I were aiming for sub 4:50 average pace. That would be a PB for her and pretty close for me. Hopefully I would have a bit left at the end to be able to increase the pace. With 800 starters, the start line was pretty congested. I couldn’t even find Beck at first but I saw her off to the side. Within the first few hundred metres we had managed to connect! The 1:45 pacer, Rick, was a little way ahead of us (we’d eventually need to pass him to get our goal time) but we were happy to sit behind him for the first little bit, and just keep him in sight. The first few kilometres were a bit slower than we would have liked, primarily because of the congestion and also because it was marginally uphill. As soon as we could overtake people and get a bit of daylight in front of us, we did. It meant we would have to run a bit faster to get back to our goal pace. We hadn’t planned to overtake the 1:45 ‘bus’ at any particular stage, just sometime before the finish line! At around the 6.5km mark, the ever expanding group was starting to impede our progress. It was time to make a move. We overtook the bus and almost immediately after that, the threatened shower eventuated. It wasn’t heavy and it wasn’t long but it was enough to make the ground a bit slippery. Especially since pretty soon after that we would encounter a wooden walkway – I called out to everyone around me to be careful. It was around this time that Beck and I found ourselves running behind two men, who she jokingly thanked for being a windbreak for us! They didn’t come with us when we overtook the bus, but it wasn’t long before one of them, Tom, was with us again. I had seen him before at parkrun but we’d never run together before in an event. We would end up going back and forth for the rest of the race. Also around us was Peter, who I had run with a bit at Clare. He wasn’t having the best day – we also went back and forth but after I passed him later in the race and then didn’t see him again, I knew something wasn’t right! He ALWAYS beats me – not by much, but by enough! 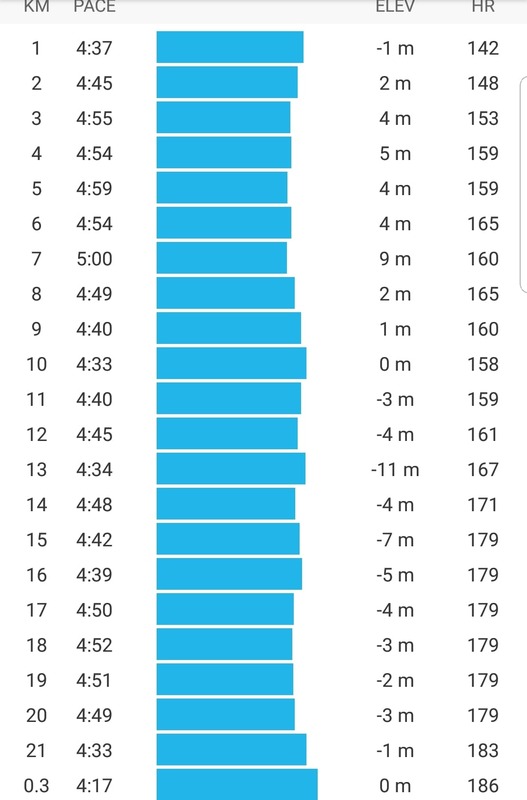 The slow start and subsequent push to get back under 4:50 pace probably took a bit out of me and meant that my ‘traditional’ fast finish wasn’t on the cards. Then there was Cleland last week. So yeah, there were probably a few contributing factors. Around this point I saw a few friendly faces. 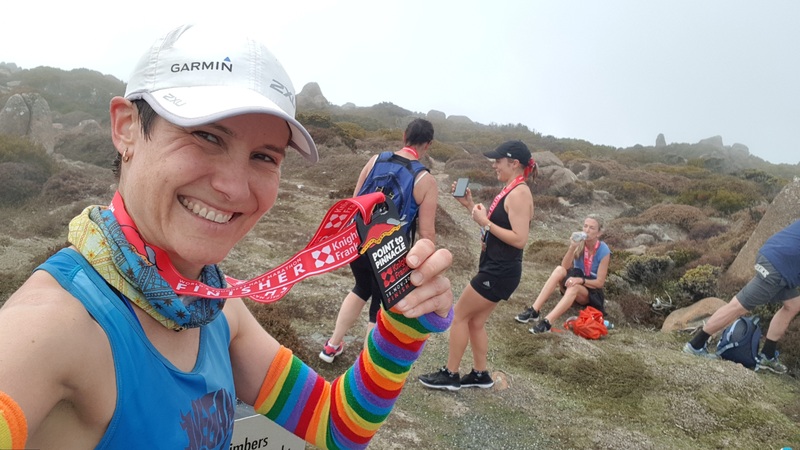 Chantel, who is on the comeback trail from a nasty bike accident was out taking photos because she wasn’t yet ready to run it. It was great to see her smiling face out there. Hopefully she’ll be able to join me at Gold Coast in July! Then not long after that I saw Nat, my cycling coach, on a drink station. I gave her a cheer and a thankyou – I didn’t stop at all for drinks because I was carrying my own. It was great to see her regardless. The rest of the race was a bit of a blur. There was my friend since high school, Tracie, official photographer in Elder Park – hopefully I gave her some good shots! After passing Tracie I said to those around me (but probably more for my own benefit) “Look straight ahead. Do not, whatever you do, look right”. That was because on the right, across the river, was the finish line. We were still more than 1km away from reaching it – we still had to run up a nasty little hill, back across the Torrens Weir, and along the other side. Seeing the finish line now would be just demoralising. We knew it was there, but seeing it just made it more real! I had stopped looking at my watch by now. “Que sera, sera”, I thought. I didn’t think I had made up enough time and I didn’t really have a whole lot left to smash out a fast final km. When I felt my watch vibrate to signify 21km I knew I had about 200m to go. My watch had consistently been about 100m ahead of the actual distance. 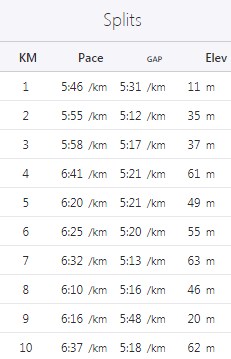 Possibly because I hadn’t started right at the front of the 800-strong pack, maybe the overtaking along the way, and maybe simple satellite inaccuracy, or a combination of all 3. I entered Pinky Flat and could finally see the beautiful sight of the finish line! Despite being pretty much spent by this point, I was sure I had another 200m left in me! I remembered to get my medal first before ducking under the bunting to collapse in a heap! It was not 30 seconds later that I saw Beck cross the line for a new PB! She was stoked and I was too, for having been a part of it! She said she had been able to see me the whole way – my choice of a hi-viz yellow top probably helped! We are both hoping to run Boston qualifiers this year and based on that run today she is well on track! After the presentations it was time for the hard run home. It ended up being a bit over 9km, mostly (ever-so-slightly) uphill, on tired legs with my UTA100 backpack. I was so happy that Adelaide United had forced me to abandon my plans of running 21k back to Athelstone. 9km was more than enough, thankyou very much! I was never so happy to crack open an icy cold can of Coke than I was when I staggered in the front door just after midday! 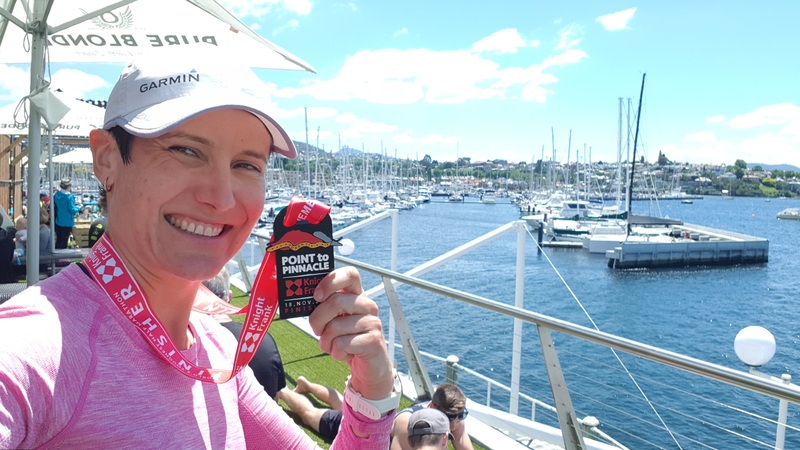 I had managed to fit in a relatively fast half marathon as part of my marathon training, as well as some ultra training on top of it. It had been a good day. And as history shows, it got better. 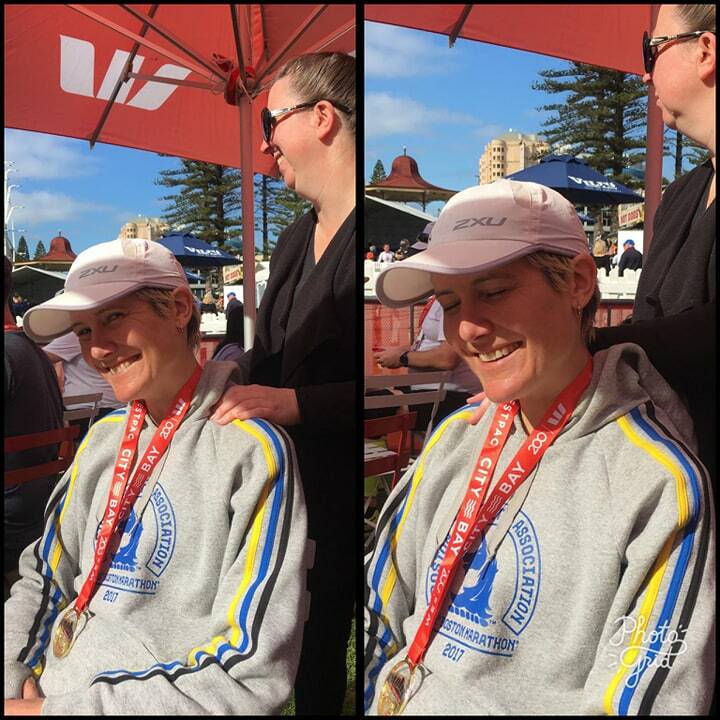 There wasn’t time to collapse on the couch and become a vegetable for the rest of the day – I had an A-League Grand Final to get to! So I quickly demolished a pizza and got a bus into town. And my team, Adelaide United, the mighty Reds, prevailed 3-1 in front of 50000 roaring fans at the Adelaide Oval, which I had run past only hours before.